시간이 지나 생기는 과다피지를 초미립자의 세범컨트롤 파우더가 계속적으로 흡수하여 기름기로 인한 화장얼룩이나 뭉개짐현상을 극복 오일블록 파우더 함유로 넓고 칙칙해진 모공부위를 커버해 섬세한 피부표면을 유지하며, 블루밍 파우더 입자가 빛을 컨트롤하여 밝고 화사한 피부를 연출해 줍니다. 퍼프에 적당량을 묻혀서 피부결을 따라 얼굴 전체에 골고루 발라줍니다. 메이크업이 들뜰 수 있는 T존, U존을 중심으로 한 번 더 꼼꼼하게 발라줍니다. Micro-particle sebum control powder constantly absorbs excess sebum to prevent smudges or lumping due to oiliness, while oil block powder covers expanded and darkened pores for delicate skin surface. Blooming powder particles control light for clear and bright skin. 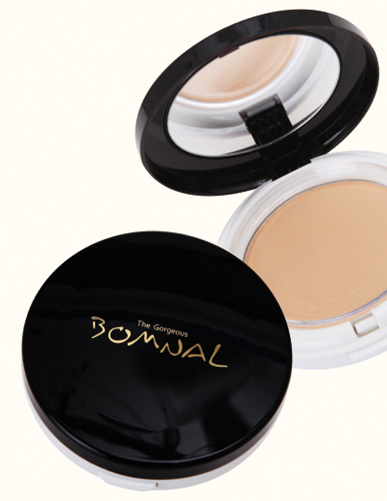 Apply an appropriate amount onto a puff and apply evenly over face along skin texture. Apply another layer over T-Zone where makeup tends to get cakey.